Residents often create a power of attorney to enable someone to conduct their financial affairs for them. A principal can use this to allow an agent to pay bills in the principal’s name, buy or sell property on behalf of the principal, or cash and deposit the principal’s checks. You can create a general power of attorney, which enables the agent to conduct most anything the principal has the right to conduct. 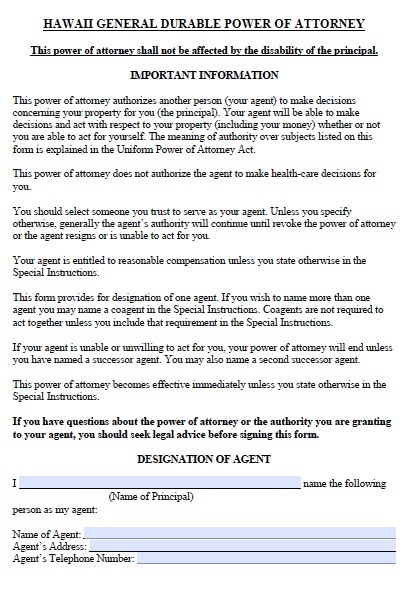 Or you can create a special power of attorney that limits what the agent may do to only one or multiple specific functions. You can also create a “springing” power of attorney, which only goes into effect if a specified event occurs, usually if the principal becomes incompetent. Given Hawaii’s large elderly population, it is important only to select someone whom you trust completely as your agent because there is great potential for financial abuse. You should also make sure your agent understands exactly how to conduct your business and routinely oversee his or her conduct.